First up on the docket for this morning is a potential bottom play that we’re going to want to put on our radars over the coming sessions. SYRS reported some less-than-ideal clinical data, and the stock got absolutely crushed yesterday. We don’t ignore news developments, but we are constantly looking for over-abused stocks to pounce on during their recoveries, and one definitely seems in order for this play at the present juncture. The filling of the gap that was left on the chart by the sell-off would mean roughly 50% in gains from the current PPS. We made it known yesterday morning that we had an interest in tracking the THC 01/26 $13.50-14.50 Calls as the stock appeared to be ripe for continuing its recent bottom-bounce. THC did just that, but our tracked options didn’t heat up too much yet, posting gains of just 15-24% on the day. That could be set to change today, as the stock is showing signs of a gap up and possible continued upward momentum this morning. We’ll be sure to make monitoring the ongoing activity here one of our top priorities for the rest of this week. This may only be the beginning of THC’s rebound off of its recently established new annual lows. That was followed up by a pullback to a low of 12.01 on 11/30, and since then the stock has been making a push for those highs once again, yesterday reaching 23.67. That’s an added swing of 97% on top of the previous run we witnessed, and it leaves us interested to see if the stock can re-test and possibly breach the highs off of the previous run. We’ve unearthed a couple of stocks that are trading just above their recent relative lows, and wanted to relegate them to a bottom watchlist this morning. We’re getting strong multiple-bottom signals from each one, and will formulate a couple of corresponding options ideas. Tenet Healthcare Corp. THC - This stock strung together three sessions of higher lows and higher highs to close out last week, with a ton of room to the upside. We’re going to be signaling our interest in tracking the THC 01/26 $13.50-14.50 Calls as the stock attempts to continue the beginnings of this uptrend. 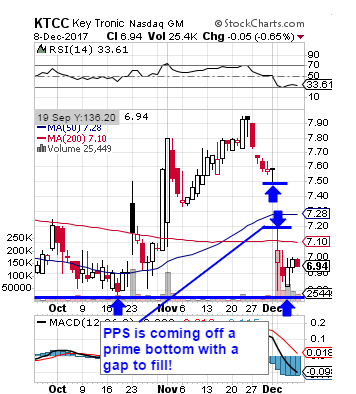 Key Tronic Corp. KTCC - This play has been attempting a recovery of its own, after a sizable gap-down hit it this past Monday, as pictured on the chart snapshot below. We’ll be waiting in the wings with an options idea in this case as well, with the KTCC 02/16 $5 and $7.50 Calls.